Biceps Bonanza, Turbo Triceps, Forearm Fiesta: How to Get Sculpted Arms – Why Am I Unhealthy? If you already work out fairly often, you’re probably pretty proud of your guns. There’s nothing better than whipping your jacket off at parties or the gym and surreptitiously flexing the old dogs. Who doesn’t like a bit of attention? If you’ve ever looked in the mirror to check out how the bad boys are doing you’re more than likely confident and proud of them. Have you ever checked out your arms from a different angle though? From the inside your biceps might bulge and you might have a decent size on them. But what about your triceps and the outside of your arm; are you paying enough attention to these areas? Holding your arm down and flexing your biceps you might not have that much definition from the side view. This is more than likely due to you training with a limited range of motions, as opposed to a variety of exercises. 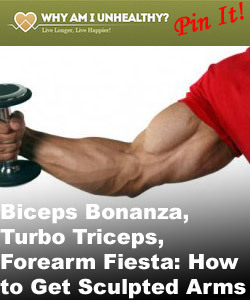 Triceps, forearms and various areas of the biceps might be missing out on some much needed TLC. Tonnes of guys simply don’t pay enough attention to the other areas of their arms. One way that people neglect their biceps is by not having proper form. Form is essential in building up definition and mass. The reason that some people don’t have a decent definition from the side view of their biceps is because they’ve not actually developed their brachialis properly. The brachialis is the outside of your bicep and is very often a problem area for some people. The inside of your bicep is called the brachii, this is a part of the muscle that many people try to simply bulk up and put a lot of effort into it. Simply doing this might look good from some angles but sadly, won’t give you the whole package – if only it was that easy. By using proper form you can develop both parts of your bicep and are sure to achieve the killer definition that you really want. Ensure that you practice proper form and research what it is that you’re doing wrong. You’ll be sure to start seeing serious results in a very short amount of time. There are a few simple exercises that will best develop your biceps. If you’re wanting to see exponential growth and definition then simply focus on these exercises and develop a workout routine around them. Adding these into your weights routine and researching the optimal weight you should be lifting (along with how many reps and in what position) should help you focus on definition and great mass. Another point that’s worth looking into is the grip width and variations that you should be practicing. The triceps seem to be problem areas for a lot of people. They’re one of the most important muscles to work on if you’re trying to add tone and definition to your arms. Well-built triceps can make even flabby biceps look good. They help to shape the rest of your arm and fortunately aren’t too hard to work out. If you’re a first-timer at working the triceps though, make sure to take care. Some of these you may not be familiar with, we’ll go into more detail in them in future articles but for now just look them up and try them out. When we cover these exercises at a later date you can expect a scientific breakdown of what it is that makes them build muscle and how you can optimize your technique and form. A lot of guys might look all that in the upper arm but be lacking significantly in the forearm area. I myself have been guilty of training the biceps and triceps too hard and not focusing on my forearms. By working on the forearms and getting nice lean muscle that pops your overall image will improve though. Having your arms look sculpted and more symmetrical is a lot more impressive and attractive than plain old bulky biceps. These are all fairly simply exercises but can help give you the definition you want in your forearms. The reverse wrist curl with a dumbbell is especially useful for working the forearm extensors as well as developing balance. Working each forearm separately and focusing on proportion is massively important. Full-arm definition is a rare site down the local gym, many people are simply too top-heavy when it comes to their arms. The sign of a true body builder is perfectly sculpted forearms. Too many people simply ignore them in their workout routine and don’t reap the benefits of even, toned arms. Hopefully you’ll take something out of this quick reference page. Look out for more detailed guides to sculpting your arm and getting the definition you want in the future. As previously mentioned, we’ll go into a lot more detail about the exercises we’ve mentioned here. If you’ve struggled with any of them because you’re a newcomer (or simply have never tried them before) then worry not. We’ll take care of you. After reading this quick guide you should understand why it’s essential to pay attention to all parts of your body. The same rules apply for a lot of other muscles, some people spend hours working their lower legs but haven’t got a shred of muscle on their thighs and upper leg. Consistency and symmetry is the key, working out is an art form and rigorous routines that push the whole of your body equally are the key to mastering this art. You guys cover it all!